An amount of Ksh. 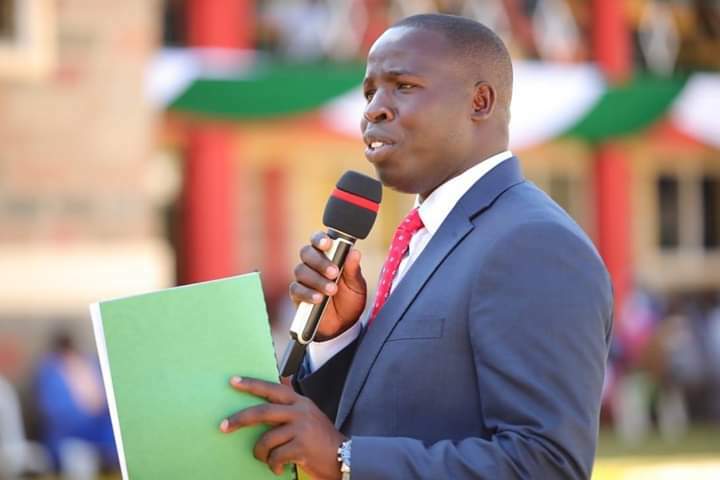 42 million has been disbursed to needy students in Secondary, Vocational Training Centres and those with Special Needs, Governor Stephen Sang has said. Governor Sang awarding one of the top student at last year’s KCSE exams from the school. Governor Sang revealed that Ksh. 18 million was disbursed to students in Secondary, with Ksh. 18 million going to Vocational Training Centres and six million benefiting students with Special Needs. Ksh. 18 million will be disbursed to University and College students in the last quarter of the 2018/19 Financial Year. 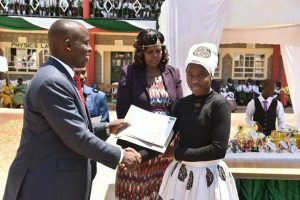 Speaking at St. Joseph’s Girls High School Chepterit during a thanksgiving ceremony to celebrate 2018 KCSE results, Sang said the County bursary scheme has helped many students who faced fee problems to complete their education. While encouraging residents from needy backgrounds to apply for bursaries at the Ward level, Governor Sang encouraged students to put more efforts in their education for them to have a better future. Students of St Joseph’s Girls Chepterit during the Thanksgiving giving service held at the school. ‘The identification of bursary beneficiaries has been devolved to the Ward level to ensure that genuine needy cases benefit from the bursary,’ said Sang. The Governor urged students not to be distracted by their background but to concentrate on their studies since that was the only way they could change their lives and the lives of their families. ‘I am an example. I was raised in a very humble family and I want to encourage all of us to put in that extra effort,’ encouraged Sang. “Don’t worry about your background because that should not define your future. If I worried about my background, I wouldn’t have reached where I am today. Focus on your studies,” he added. 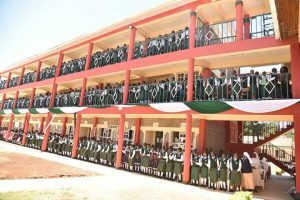 He said that his administration was keen on supporting the Education sector in the county by ensuring that infrastructural development in schools are fast tracked and needy students get support through the county bursary scheme. “My administration will continue issuing bursaries to needy students to enable them complete their education and actualize their dreams,” he said. He added that his administration was working closely with the National Government to ensure that infrastructural developments in schools are fast tracked.